Quantitative Easing Is Like "Treating Cancer With Aspirin"
There is, of course, no counter-factual. We’ll never know what might have happened if the world’s central banks had not thrown trillions of dollars at the banking system, and instead let the free market work its magic on an overleveraged financial system. But to suggest credibly that QE has worked, we first have to agree on a definition of what “work” means, and on what problem QE was meant to solve. If the objective of QE was to drive down longer term interest rates, given that short term rates were already at zero, then we would have to concede that in this somewhat narrow context, QE has “worked”. But we doubt whether that objective was front and centre for those people – we could variously call them “savers”, “investors”, or “honest workers”. As James Grant recently observed, it’s quite remarkable how, thus far, savers in particular have largely suffered in silence. So while QE has “succeeded” in driving down interest rates, the problem isn’t that interest rates were / are too high. Quite the reverse: interest rates are clearly too low – at least for savers. All the way out to 3-year maturities, investors in German government bonds, for example, are now faced with negative interest rates. And still they’re buying. This isn’t monetary policy success; this is madness. We think the QE debate should be reframed: has QE done anything to reform an economic and monetary system urgently in need of restructuring? We think the answer, self-evidently, is “No”. The toxic combination of more credit creation and global financial repression will merely make the ultimate endgame that much more spectacular. To Jim Rickards, simply printing money and gifting it to the banks through the somewhat magical money creation process of QE is like treating cancer with aspirin: the supposed “solution” does nothing to address the root cause of the problem. The West is trapped in a secular depression, and “normal” cyclical solutions such as monetary policy measures, are not just inappropriate, but damnably expensive for the rest of us. Only widespread economic restructuring will do. And that involves hard decisions on the part of politicians. 1. Yes, QE has driven down long-term interest rates. 2. But the problem wasn’t the cost of capital. The problem was, and remains, an oversupply of debt, and the risk, now fast becoming realized, of widespread debt deflation. To put it another way, the world appears to be turning Japanese after all, despite the best efforts of central bankers and despite the non-efforts of politicians. 3. The solution is fundamental economic restructuring. Government spending cuts will not be optional, although tax cuts might be. The expansion of credit must end – or it will end in an entirely involuntary market-driven process that will be extraordinarily messy. This is where we start to view the world, once again, through the prism of investments – not least since we’re not policy makers. Markets have become that much more volatile recently (and not just stocks – see the recent wild trading in the US 10 year government bond). Moreover, inflation (other than in financial asset prices) seems weirdly dormant in certain parts of the world. Understanding these phenomenon is best explained by both Jim Rickards and by the good folks at Incrementum through the pertinent metaphor of tug of war. The blue team represents the markets. The markets want deflation, and they want the world’s unsustainable debt pile to be reduced. There are three ways to reduce the debt pile. One is to engineer sufficient economic growth (no longer feasible, in our view) to service the debt. The second is to default (which, in a debt-based monetary system, amounts to Armageddon). 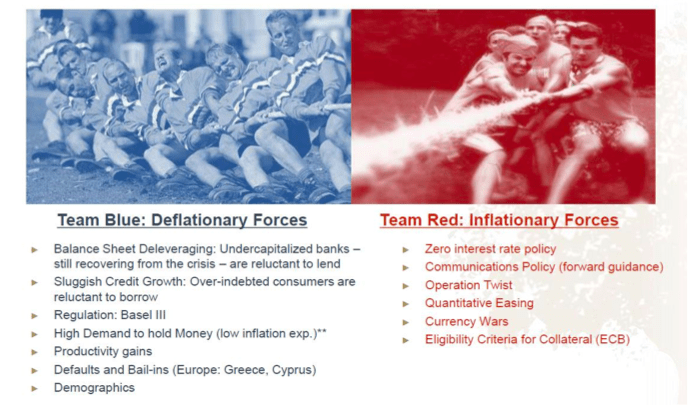 The third brings us over to the red team: explicit, state-sanctioned inflationism, and financial repression. The reason why markets have become so volatile is that from day to day, the blue and red teams of deflationary and inflationary forces duke it out, and neither side has yet been convincingly victorious. Who ultimately wins? We think we know the answer, but the outcome will likely be a function of politics as much as markets.